As Monterey Car Week approaches I’m trying to finalize the week’s agenda, planning which events I’d like to attend and lay out a timeline for each one. I’ve found that having a plan during car week helps maximize enjoyment and relieve the stress of trying to figure out what to do last minute. 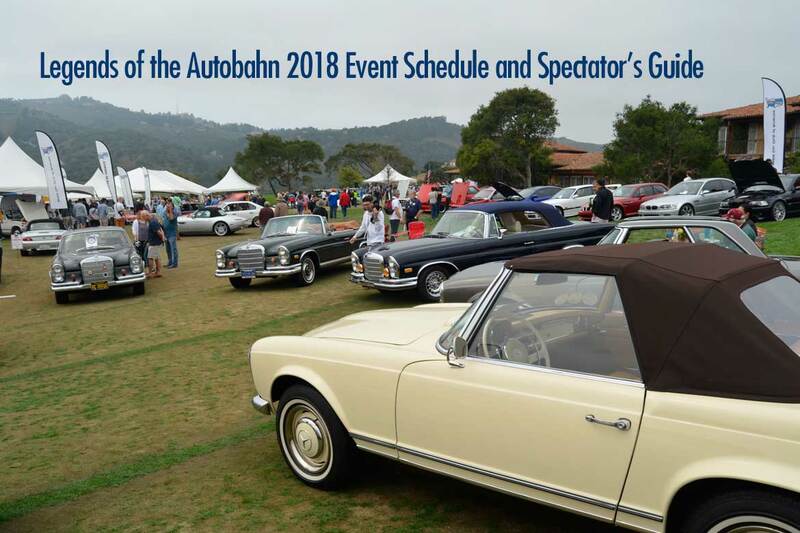 Having a look at the Legends of the Autobahn Event Schedule 2018, I’ve decided it will be my Friday morning / early afternoon activity before heading to the Equestrian Center at Pebble Beach for the Gooding and Company auction. After my first experience attending ‘Legends’ at the Nicklaus Club in 2016, specifically, getting there, which was a complete debacle, I thought I’d post this article for first time attendees / spectators of the show. Legends of the Autobahn is the all German car show put on by the MBCA, BMWCCA and the Audi Club of America. Held at the Nicklaus Club-Monterey golf course along Highway 68, near the Laguna Seca race track. It’s a great venue with plenty of space and good facilities for this car show that, according to the official Legends of the Autobahn website, ” draws over 400 registered cars and over 3,000 spectators.” As of this writing, just a few weeks before the show, under the question “What are the featured cars on the field for this year’s event?” on the event website it still says “Featured Cars have not yet been announced.” So I’m not sure what special cars or categories are being featured. For the uninitiated spectator, the trick can be, getting there quickly and efficiently. In 2016 I followed the only directions provided on the show website and found myself at the ‘exhibitor’s only entrance’ after sitting in traffic for a half hour only to be turned around and sent away to find a different entrance miles away. 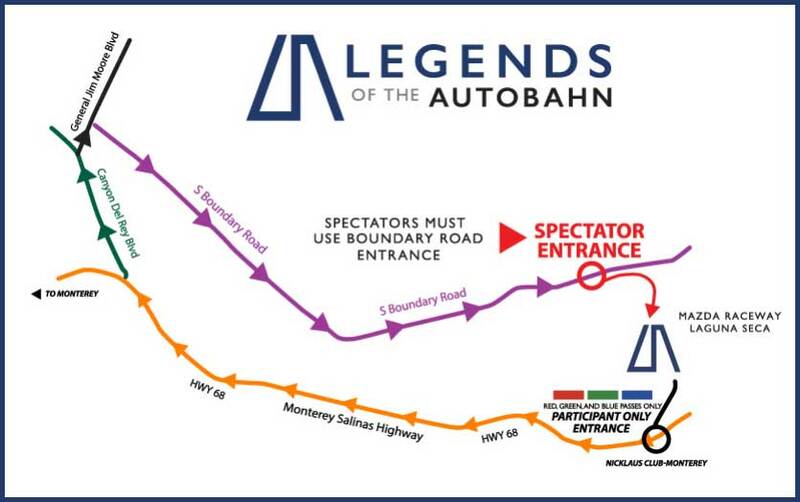 There are now clear directions for both spectators and those showing cars at the event as to how to arrive on the Legends of the Autobahn website, Click the map below to visit that page. On the website you will also find complete Legends of the Autobahn Event Schedule. Remember, directions to arrive at teh show are different if you are showing a car or if you’re just a spectator. Notice, that as a spectator, you turn LEFT, off of Hwy 68 onto Canyon Del Rey Blvd right past the airport, then follow directions to the entrance onto S. Boundary Rd. which skirts the south edge of Ft. Ord. If you try to go all the way out 68 and turn in the front gates of the Nicklaus Club you will be turned around and sent back the way you came. Once you wind through South Boundary Rd. you will be directed onto cart paths and dirt roads to the grassy parking areas, it’s easy enough, but if you’re driving a lowered AMG hot rod you might scrape your front valence. Organizers bill the event as ‘free to attend’ but, in fact, there is a $20 parking fee, to call it what you want. It’s about as cheap a ticket as exists for any event during Monterey Car Week and it’s well worth attending. The MBCA’s Silver Star Preservation Class always has a good turn out. This is another area where planing ahead makes sense. There are food options at the show (complete list with prices below), but a cheap, $20.00 event becomes more expensive when you’re part of a captive audience. Food quality is decent, but I don’t think it’s any kind of ‘value’ or even worth the money. Furthermore, I’ve seen food run out in past years. Pack a cooler in your car and have a picnic of your own on the grounds, that’s what a lot of the folks showing cars do. 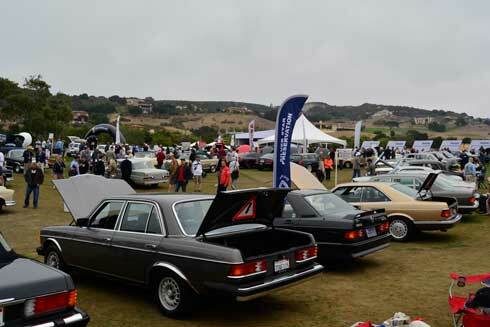 There is always a great turn out from the BMWCCA at Legends of the Autobahn. 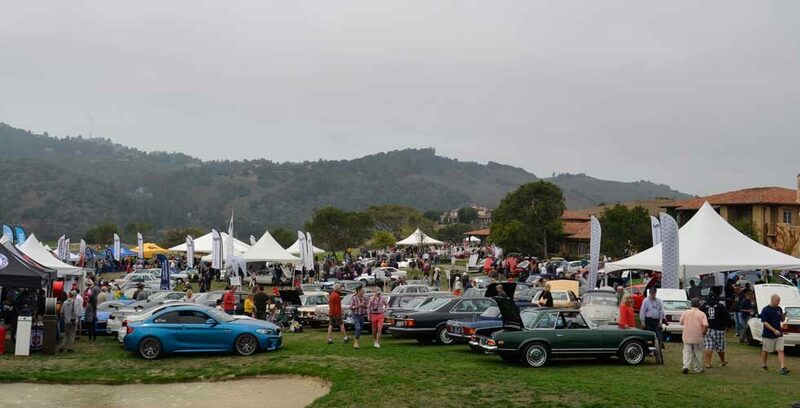 You can ensure your enjoyment of one of the biggest all German car gatherings during Monterey Car Week if you plan ahead and arrive early to Legends of the Autobahn. The morning often starts out grey and cloudy, typical of the Monterey Peninsula, but quickly heats up once the fog burns of by the late morning or early afternoon. Hope to see you there in 2018!